Compared to the head and thorax, the external structure of the abdomen is pretty simple. The abdomen is associated with reproduction as it has both internal and external reproductive structures. Internally, the abdomen also houses part of the digestive, circulatory and respiratory systems. The respiratory system of insects is very unique and quite different from the respiratory systems of many animals with which we are familiar. Insects breathe air, but their air-breathing system is not associated with lungs or the circulatory system. Instead, insects take air into their bodies through a system of small branching tubes (the trachea) and air sacs that extend throughout the body and open to the outside at openings called spiracles. Spiracles occur on the thorax and abdomen and usually have valves that open and close the tubes. Movement of air in the spiracles is by diffusion, but movements of the body, particularly the abdominal muscles, can add in air movement. Oxygen diffuses into the body tissues by diffusion as well. 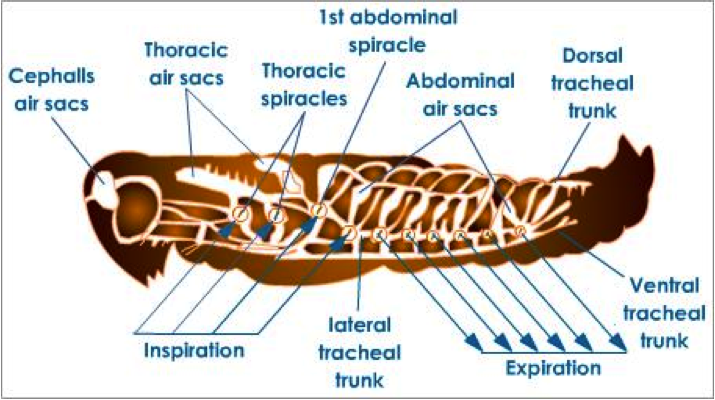 Air typically comes in the thoracic spiracles out the abdominal ones. Figure 8.6: The tracheal system of insects.